It’s been a complex project with multiple internal and external suppliers and we did three things that worked really well. One, running a proof of concept to flush out user requirements early on at low cost and low risk; Two, building clickable prototypes to allow users to get their hands on the product early and further refine requirements; And three, choosing NMR and their partner suppliers who we’ve been able to work with productively throughout. NICK HAWORTH, HEAD OF TECHNOLOGY, STUDIOS, ITV PLC. ITV has implemented a new campaign management system to streamline the production and delivery of on-air and digital marketing campaigns. The campaigns inform tens of millions of ITV viewers a month about up and coming ITV programmes and fill over £270 million of airtime a year on ITV’s broadcast channels and digital services. The system has been delivered by ITV Technology working with lead supplier NMR, a UK based media technology systems integrator. It combines a custom built media planning application for broadcast and digital media with a media asset management system to keep track of video assets. NMR software partners Vidispine and Cantemo provided the base products, with custom development work carried out by Codemill - all based in Sweden. To make the system as easy as possible to use, the ITV project team hired a London based user experience agency, 100 Shapes, to design an intuitive user interface. We looked at off the shelf systems for our requirements, but despite short-listing some of the market leaders, we couldn’t find anything that would sit comfortably within ITV Group Marketing, without compromising something along the way. The new campaign management system had to work on multiple platforms, be able to integrate across the various Marketing, Creative and Production disciplines, work with our affiliates and partners (UTV, STV, ITV Choice), be web-based and, as ITV Creative is a vital link in the transmission chain, co-exist with our programme scheduling system and talk to the team at Ericsson where we play out the UK channels. We needed a system that took the complexity and effort out of managing the operational process of handling hundreds of campaign management assets every month. To support our ambition to be the best in-house creative agency we needed a system that would handle broadcast, digital, social and off-air in one place. The system is a single source of truth for all in the Marketing, Media Planning and Creative teams. MATT SCARFF, DIRECTOR OF ITV CREATIVE AND ITV EVENTS, ITV. To make the system as easy as possible to use the project team hired a specialist user experience agency, 100 Shapes, to design an intuitive user interface. The London based team worked side by side with ITV’s Marketing and Technology teams to develop a prototype that was tested on demanding users in ITV’s media planning, marketing and creative departments. The feedback was used to tweak and perfect the designs ahead of the complex task of building the custom application at the project’s development partner, Codemill. The developers, based in northern Sweden, were not starting from scratch, in their quest to build the system. ITV licensed out-of-the-box media asset management and portal software from two Swedish companies, Vidispine and Cantemo. Working with their UK based systems integrator NMR, the ITV project team embarked on a 12-month programme of work to build and configure the system, then integrate it into a host of ITV applications and services used for channel scheduling, channel playout and archive. NMR had an established reputation in the UK media industry having supplied the Guardian’s video management systems and supported ITV’s content delivery modernisation project. 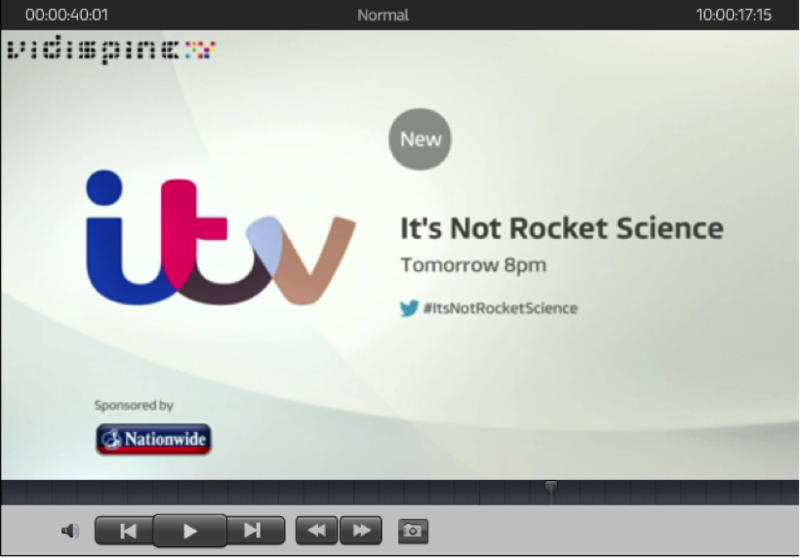 This completes the modernisation of ITV’s marketing campaign management and production systems. The end result is a system that combines out-of-the-box software with a highly intuitive custom-built application, that makes it quick and easy to use. We’ve achieved resilience and scalability too by deploying much of the system in the cloud, a task made possible by ITV Technology’s in-house Common Platform DevOps team. 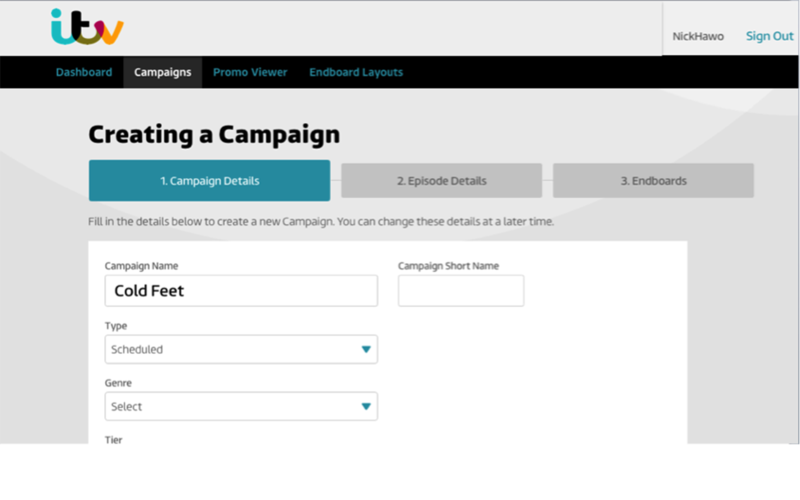 For the ITV’s Media Planning team a bespoke application was developed to make the once laborious task of entering campaign data for multiple promo versions, a breeze. Logic was applied to the system to calculate delivery milestones based on the first play out dates for campaigns. Functionality to allow bulk changes to be made to data significantly reduced effort. The media planning data was integrated using the Vidispine API into ITV’s channel scheduling systems to allow near instant availability of promos for scheduling in the right airtime slots. The media planning system allowed the teams to plan not just broadcast campaigns, but digital, social and off-air campaigns too. For ITV’s Marketing team the priority was easy access to campaign data and to an easy way to enter marketing briefs for specific campaigns. There was a requirement to share briefs with third parties who would not necessarily have access to the system. This was achieved by integrating the campaign briefs into Google Apps to allow users to create a shareable document with a single click. When the time came to view the finished campaign assets the Marketing team were able to view them on the system’s Promo Viewer and give final approval before sending them on to ITV’s broadcast playout centres with another single click. Through a series of campaign status indicators, the Traffic team were able to keep track of the progress of each campaign, with alerts and notifications. They were able to allocate creative teams to the campaigns. Similarly, the Compliance team were able to easily add compliance codes to either individual or multiple videos - vital to prevent inappropriate content being broadcast on ITV’s channels. The data associated with each asset is held in the Vidispine media asset management system. The Creative teams whose job it is to come up with the creative idea for campaigns were able to search easily for assets and build their very own campaign dashboard so they could easily see the work they had been assigned to. Integration into the Avid production system, implemented a year earlier, has enabled seamless movement of rough cuts and finished assets into the system for review, approval and delivery to broadcast and digital channels - and making good use of the Cantemo Portal functionality. One big and very laborious task is the creation of multiple versions of end boards - coming soon, tonight, tomorrow etc. The system will in time largely automate that process with the data entered by the media planners flowing throw from the Vidispine API to the high-end graphics rendering engines supplied by Pixel Power. It means more resource freed up for creativity. As system integrators NMR worked side by side with ITV Technology’s Common Platform / Dev Ops team to deploy the software from Cantemo, Vidispine and Codemill onto AWS using Puppet scripts to synchronise multiple environments. NMR will continue to provide third line support to ITV through further developments of the system and new deployments of software updates. This has been a truly collaborative project. As the primary contractor for the system we have had the opportunity to deliver a large and complex workflow system with modern architecture and an easy to use interface. The support we have given stretches beyond the ITV project team - to our partners Codemill, Vidispine and Cantemo. We look forward to giving our continuing support as the system transitions from a project - to an ever-evolving product at the heart of ITV’s marketing campaigns.